Show some respect. I don’t care what your personal religion is or what you think the Bill of Rights says about not respecting religions (that’s not actually what it says, look it up); if the bishop or chaplain or shamen says “Let us pray” (or the local equivalent, then you’ve got to show that you respect your hosts. Learn to recognize them, both our own and that of the host country. No one will expect you to sing the local national anthym (it’s not yours, after all), but you should recognize it and show respect when it’s being played or sung. If someone is giving a speech, turn your fool cell phone to vibrate only. People will understand if you pull out your phone and look at it, even get up and head towards and exit. After all, diplomats can get genuinely emergent calls at any time and no one should get bent out of shape. But if the prime minister’s speech is interrupted by the American vice consul’s cell phone everyone is going to remember it. Yes, lots of local guests will fail to heed this and their cell phones will ring and they may or may not be embarrassed. Don’t worry about them; worry about you. And worry about your reputation. You really should read the whole thing here. In addition to the cited references by Consul-at-Arms, Diplopundit has put together additional protocol items listed below that you might find useful. 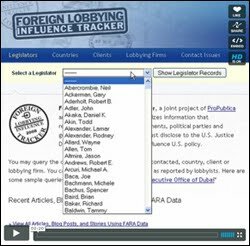 Foreign Lobbyist Influence Tracker, a joint project of ProPublica and the Sunlight Foundation, digitizes information that representatives of foreign governments, political parties and government-controlled entities must disclose to the U.S. Justice Department when they seek to influence U.S. policy. Filings under the Foreign Agent Registration Act provide more details on how lobbyists interact with government officials than those required by the Lobbying Disclosure Act; they contain information on efforts by foreign governments and organizations to influence U.S. policy on trade, taxation, foreign aid, appropriations, human rights and national security. Perhaps no player in the field shows the influence of foreign agents as much as Robert Livingston, the powerful ex-appropriations chairman who was in line to be House Speaker before a scandal derailed him. His firm, Livingston Group , reported the highest number of contacts with government officials, and Livingston was the second-biggest political giver among lobbyists for foreign agents, listing more than $99,000 in campaign contributions, most of which went to members of Congress. His clients — including the governments of Azerbaijan, Egypt, Libya and the Republic of Congo and the Bank of the Netherlands Antilles — showered his firm with $5 million in fees, the third-highest total among all firms that reported during the period. Also among them was one country with a longstanding image problem: Turkey. From 1915 to 1923, as many as 1.5 million Armenians perished, many at the hands of the Ottoman government, but a precise description of the events has been an extraordinarily sensitive subject in Turkey. The issue also has risen regularly in Congress, thanks in part to American-Armenian groups that have pushed for government affirmation  that the killings amounted to genocide. In October 2007, with elderly Armenian survivors from the era in attendance, the House Committee on Foreign Affairs approved a resolution  that would do just that. The next step would be a vote before the entire House, something Turkey wanted desperately to avoid. On more than any other issue, Turkey, which has a U.S.-led war in Iraq on its border, is seeking help in a longstanding effort to join the European Union. Turkey’s lobbyists made contact with the executive branch 100 times in a coordinated effort to persuade congressional leaders to squash the resolution. The Livingston Group worked Congress. The firm’s lobbyists contacted the office of Rep. Adam Schiff, D-Calif., author of the resolution, four times on Oct. 4 to arrange a meeting with Turkish Ambassador Nabi Sensoy. A few weeks later, Sensoy was withdrawn in protest of the House’s consideration of the measure. Turkey didn’t lobby just Congress — the country hired foreign agents to promote the cause with people outside the administration, too. Noam Neusner, who served as a speechwriter for President George W. Bush, worked the powerful Jewish lobby, meeting with an array of groups including the influential American Israeli Public Affairs Committee  a combined 96 times to persuade them to oppose the resolution, FARA records show. Turkey was the first Muslim country to recognize Israel, and relations have been generally positive; but in the end, AIPAC supported the resolution. In all, records show, Turkey spent $4.2 million to mobilize its lobbyists to influence a resolution that hinged on the single word — genocide. Some $1.9 million of that went to DLA Piper , a top-50 U.S. law firm that operates globally and has taken on such high-profile cases as the defense of imprisoned Nobel Peace Prize laureate Aung San Suu Kyi in Myanmar. The dispute demonstrates the power of labels — and the lengths to which a country will go to protect its world image. Afghan Elections Over, Now What? It basically aggregates video news, similar to the Armed Forces Network. But whereas AFN aggregates radio and TV stations, so you have Keith Olberman right next to Bill O’Reilly in their programming, Newsy aggregates the news content itself. The premise is the same, to offer multiple sourcing in one place. The Newsy videos are short segments accompanied by transcripts, comments and options to embed and/or share videos. It also claims to “truly analyze the key nuances in reporting from media outlets around the world.” I’m not sure how you do that with 2-3 min videos but its a good try, considering the trend towards micro news. Afghanistan Elections: They Both Won? One day after the elections, both Hamid Karzai and Abdullah Abdullah said they won yesterday’s vote. UK’s The Guardian reports President Karzai’s staff as saying that the incumbent president had taken a majority of votes, making a second round run-off unnecessary. It also reports that Abdullah’s spokesman, Sayyid Agha Hussain Fazel Sancharaki, said the former foreign minister was ahead with 62% of the vote. Pajhwok Afghan News is reporting that unofficial results indicate President Hamid Karzai and Dr. Abdullah Abdullah dominated vote counts in Kabul and are virtually in a dead heat (tied) in a dozen or so polling station counts. Check out U.S. Embassy Kabul’s Photos – Election Day 2009 here. On Tuesday, August 18, three of the Miss Universe contestants, Ms. USA, Kristen Dalton, Ms. Guam, Racine Manley, and Ms. Puerto Rico, Mayra Matos Perez, along with President of the Miss Universe Organization, Paula M. Shugart, took time out of their hectic schedules to meet with representatives of the United States Embassy. At the Atlantis Resort on Paradise Island, U.S. Chargè d’Affaires David Elmo presented each contestant with a U.S. flag that was flown over the Embassy as well as commemorative U.S./Bahamas flag pins, representative of the friendship between both countries. The Chargè also wished each contestant the best of luck in the finals, set to take place Sunday, August 23 at the resort. The Bahamas, an archipelago of seven hundred islands and a population of just over 300,000 is the smallest country ever to host the Miss Universe event. A group of eighty-four contestants from Albania to Zambia are competing for the coveted prize. For the last three weeks the contestants have been island-hopping whilst participating in various events. They have visited beautiful Harbour Island and the crystal blue waters of Exuma. They learned about boat building on a visit to Bimini and enjoyed Bahamian hospitality on Grand Bahama and the Abaco Islands. You know, even with my bioptics I can’t spot any female embassy official here, can you? A few more photos here; no female officials either. I can’t say what happened to them. Also, no mention if our embassy officials got to meet the reigning Miss Universe, Dayana Mendoza, the one who wrote Guantánamo was an incredible experience… I’m disappointed.